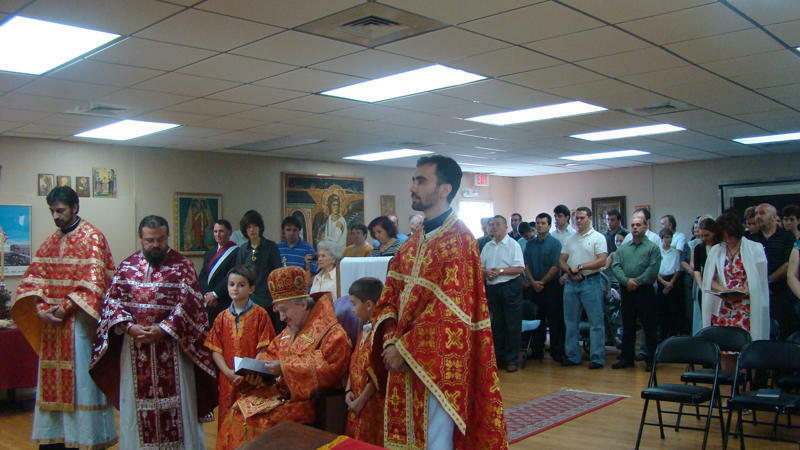 Atlanta, GA - This year’s celebration for the Slava began with evening Vespers on Saturday July 16th served by visiting clergy. 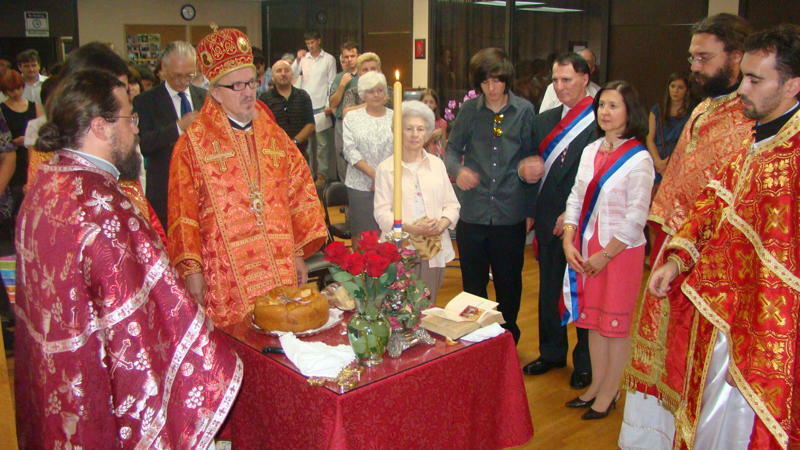 On Sunday July 17th, His Grace Bishop Dr. Mitrophan presided at the Hierarchical Divine Liturgy along with V. Rev. Dragan Zaric, Rev. Milovan Katanic, Rev. Ljubisa Brnjos, Rev. 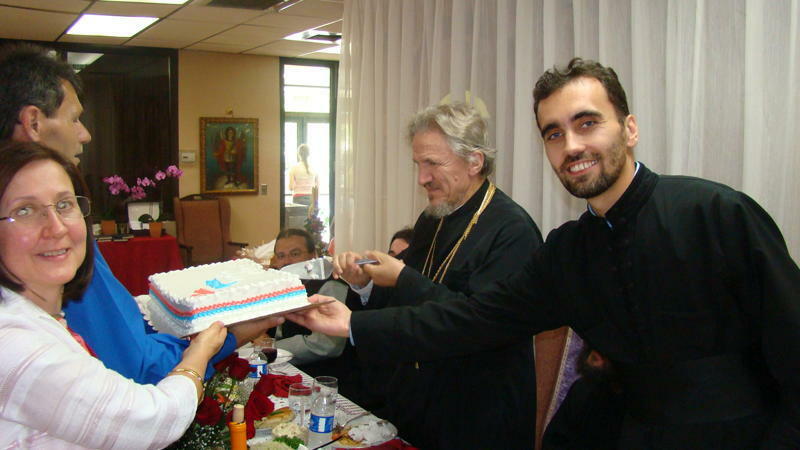 Stanislav Kravljaca and our parish priest Rev. Miladin Blagojevic. The Church Choir, under the direction of Professor Ms. Danka Vecerina, responded to the Litany. 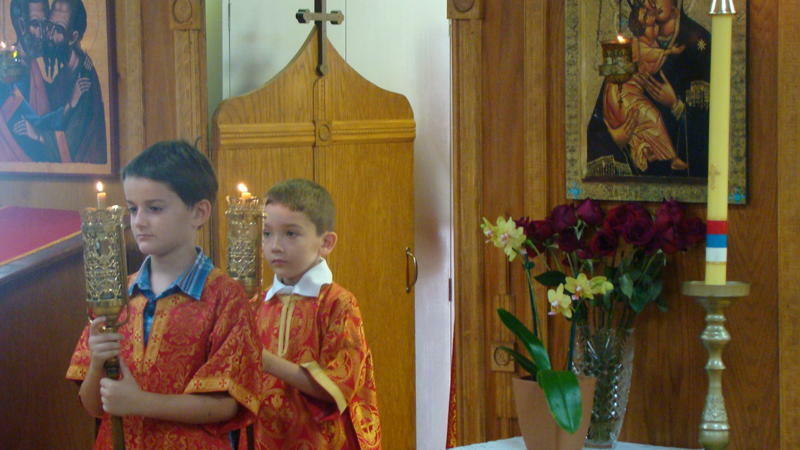 During the service many children and parishioners partook the Holy Sacrament of Communion. 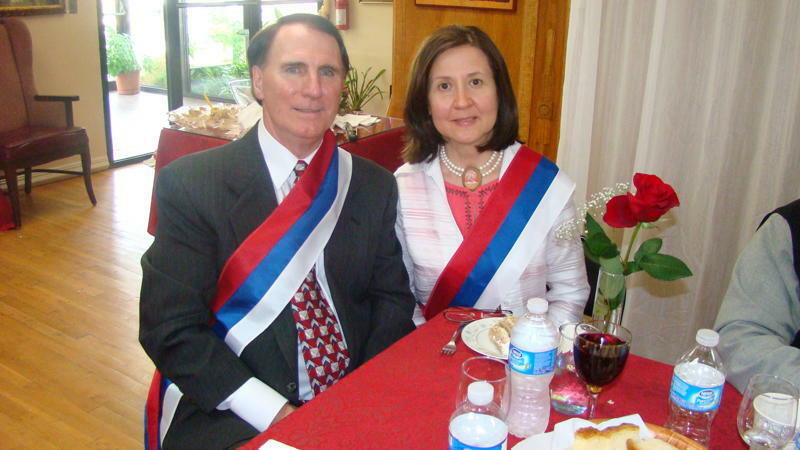 Kumovi for this year’s Slava were Milana Vujic Saulnier – President of the Church Board; husband Tom, mother Jovanka Vujic, daughter Christina and son Stefan. They are long time active honorable members of the Atlanta church. 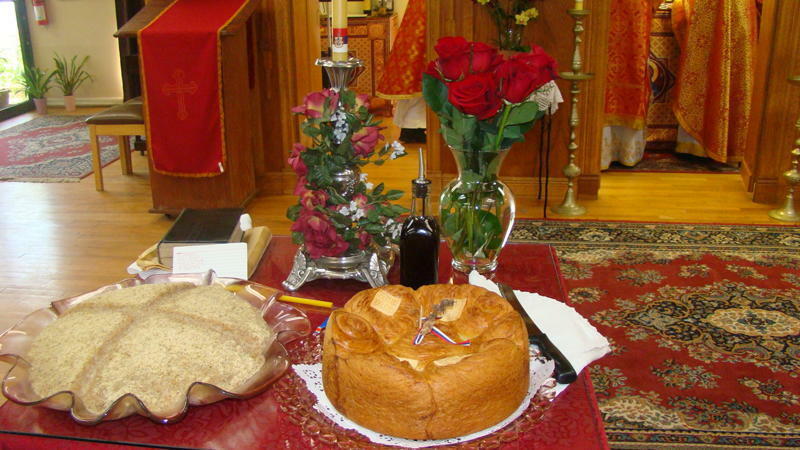 After the Blessing of the Slavaski Kolach and Koljivo ,His Grace Bishop Dr. Mitrophan wished Kumovi good health and life in peace and harmony. The Church was filled to abundance with joyful people. 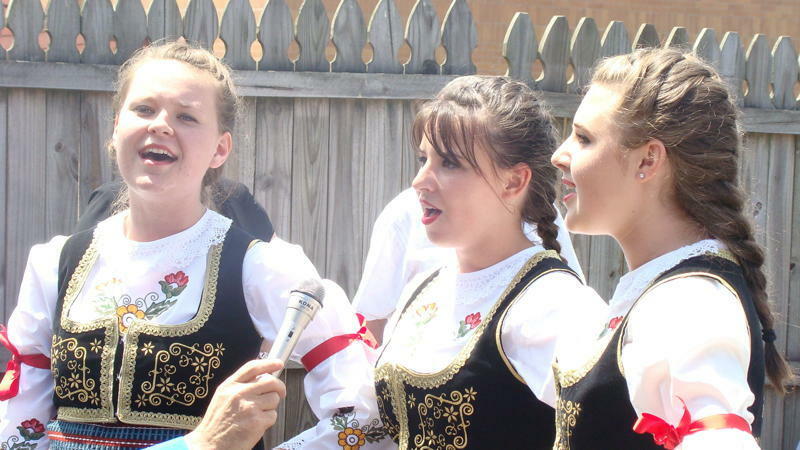 The Folklore group of young girls and boys from North Carolina performed traditional Serbian Kolo Dances and sang several beautiful folk songs, bringing the traditions and the spirit of the Old Country alive proving that traditions can be safeguarded no matter where the Serbian people reside. The festivities continued with several lovely greetings from the visiting clergy as well as our Rev. Miladin Blagojevic. 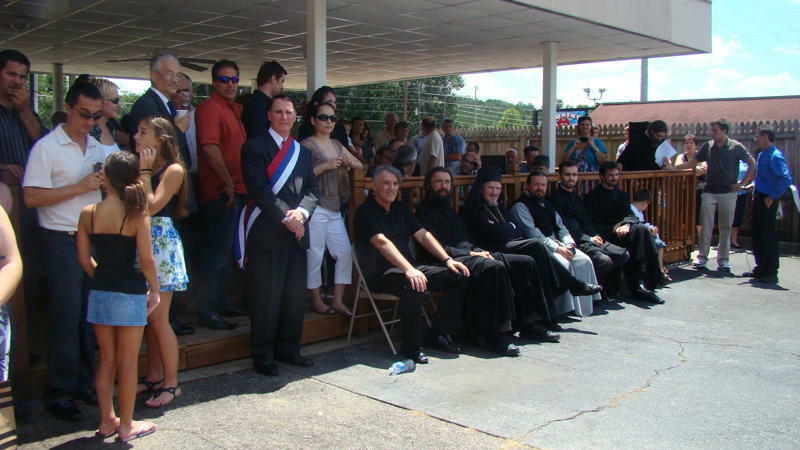 During the lunch which was prepared by the Kolo of Serbian Sisters and the Church Board, His Grace, greeted all in attendance and was pleased to see the large number of faithful on this very special day. During his greeting he pointed out the need for a new and bigger church in our growing Serbian community in Atlanta and encouraged all parishioners to continue to support in reaching this achievable goal. Our parish priest, Rev. Miladin Blagojevic, welcomed the arrival of His Grace Bishop Dr. Mitrophan, visiting clergy and all brothers and sisters for being with us for our Church Slava. He urged everyone to continue their good fellowship and support of our church and establishment of our community. President of the Church Board, Milana Vujic Saulnier, gave an inspiring speech and asked parents to raise their children in the Orthodox Church and to continue to celebrate their Serbian tradition whenever possible and read the Bible to their children teaching them the Orthodox way. President of the Kolo of Serbian Sisters, Jovanka Loncaric, welcomed the presence of His Grace Bishop Dr. Mitrophan and thanked him for supporting our church from the very beginning of our establishment in 1993. She expressed great pleasure that Rev. Milovan Katanic, who was the first priest of the Atlanta church, came to visit us and the good memories of his time spent in Atlanta. The festivities continued into the late afternoon and everybody was pleased to see that yet another year has passed and our parish is still continuing to flourish making our Serbian presence known in this part of the country.